Trail Ramblings: Have You Seen The New Draft Of The Lincoln Bike Plan? An article by Janine Copple Comments Off on Trail Ramblings: Have You Seen The New Draft Of The Lincoln Bike Plan? Phase three of the Lincoln Bike Plan is now out and ready for your review and input at https://www.lincolnbikeplan.com/ through Friday, November 30. Many of you have added comments in the preceding phases (over 600), but there is still opportunity to contribute your thoughts. The more familiar you make yourself with this draft, the more informed you will be, and more able to join in the discussion of what will encourage greater numbers of people to ride bikes in Lincoln. 51% to 56% of respondents are “interested but concerned” about riding. This plan tries to address the barriers these potential riders feel exist between them and their desire to ride more. The biggest concern stated, at over 50%, was inattentive drivers. Coming in at second was “environmental factors”, which includes weather, distance, etc. I get that. 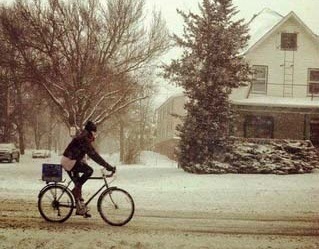 When I talk to cyclists who won’t ride in cold weather, I remember how I felt about it before I started to do it. It’s one part mind game and one part having adequate gear. Another interesting aspect of the plan is the stated need for an outreach and education plan to foster mutual respect and empathy for vulnerable road users. That we need to “humanize” people on bikes never ceases to amaze me. That there was a campaign launched against the 13th St. bike lane after it had previously been given the green light shows that there are regressive factors at work. We need to make efforts to familiarize everyone with the benefits of cycling and show that better bicycle infrastructure is good for everyone. There are plenty of interesting facts and information contained in the draft, from health and environmental benefits to economic and efficiency reasons to ride. I could tell you a lot more about what’s contained in the plan, but why not look at it yourself? It’s likely that you as a cyclist have insights that could help broaden the understanding of what could help more people ride and ride more often in Lincoln, so please look it over and send in your comments.